Excellent point. Total length is 146mm. 55mm between the races (peak to peak). 48mm from drive side end to drive side race peak. Bike has dual chainrings and a chain guard. It’s a completely original Peugeot UO-8 from 1974/5. If if I could post pics I would but BF has limited me until 10 posts. I do have a spindle, and measured it to see how closely it mirrored the one you need to replace. All measurements are within less than a mm, and it came from an AO-8 of the same vintage. So I expect it will suit your needs. As a bonus, the races are excellent. I don’t think you can send PMs yet, ut post your address and I will mail the spindle to you. 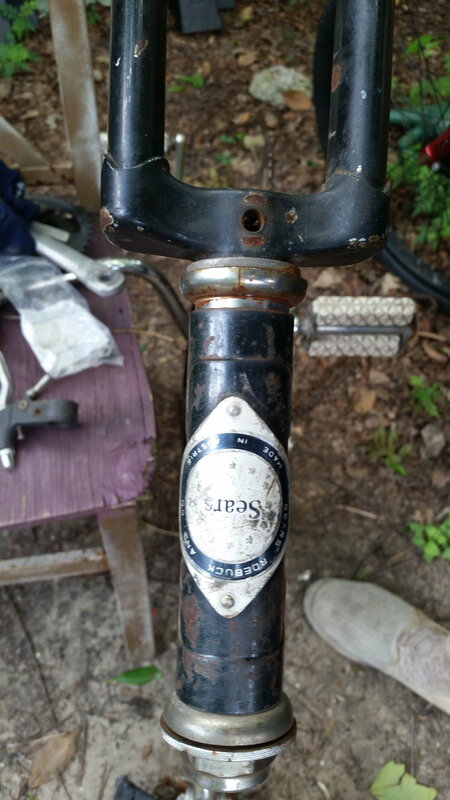 Working on this old Sears bike and found the lower headset cup is cracked. It's Austrian sized :/ anyone have a spare Austrian headset cup laying around? Willing to trade or buy, I have various 3-speed parts, a set of positron stem shifters with the correct weird rear cable deal in good condition (the derailleur is broken but could be good for parts), and lots of other functional used components. Are you certain that the cup size is unique? It appears to be slipping out of the head tube as well. Maybe you can replace the cup and cone with a matched pair from an old bike? Are you certain that the cup size is unique? It appears to be slipping out of the head tube as well. Austrian headsets can be different. Not sure how easy these are to come by but looking for a 24.0 ally Laprade style seat post. Last edited by scozim; 04-13-19 at 05:31 PM. immediately after). I’m assuming you will receive notification in your email of my quoting you in the forums so you should see it there. Last edited by Estate; 04-14-19 at 12:08 PM. I had already removed the cup, just set it back in the head tube for the picture. It's definitely Austrian sized. I thought of trying to shim an ISO cup, but the steer tube of the fork is actually slightly bulged and will not fit through the ID of a standard cup. ISO: Gipiemme Sprint rear hub 32H. I assume these are freewheel only. I pulled my Torelli S Strada out for a pre-ride inspection and found that the rear hub flange had broken out around two spoke eyelets. I reckon it was better to break in storage than on a ride. ISO: 2 700c rims in silver. 36h. Going on a touring bike, so double walled and wide is preferred. Some patina is fine. Trades welcome, I have a WIDE variety of stuff. Or I can buy outright. PM please. Anyone have a fairly decent Raleigh bronze root beer coloured front mudguard they want to trade for? 26” wheeled 3 speed needs a cover. I should have one, I I'll have time to look tomorrow or Tuesday. Visit Fat Tire Trader's homepage! Probably have one, will look. actually no, I did not get a notice. i’ll PM you instead with my email, ok? Yes, cottered crank. The bike is nearly perfect except for the spindle. I couldn’t believe it was pitted with how well this bike was taken care of. It still had the original Hutchinson tires and Michelin tubes. I don't think I took mine apart until the last year I had it, when I joined a school club. Last edited by Last ride 76; 04-15-19 at 04:21 PM. ISO 36 hole C Record front hub, nice would be nice, doesn't have to be perfect.